Boring cottage cheese for lunch used to be the price we paid for too much feasting over a holiday. It was a diet food and we just put up with its blandness. No more. Cottage cheese is ‘in’ and there are lots of recipes that include it. It is full of protein and some new versions claim to include the live, active probiotic cultures that we are told are so healthy for our gut. Move over yogurt. What is cottage cheese? Acids and sometimes enzymes are added to pasteurized skim milk to form curds. The curds are cooked, washed and salted. Cream can be added. The amount of cream determines the percentage of milk fat that you see on the label. When no cream is added you get fat-free cottage cheese. 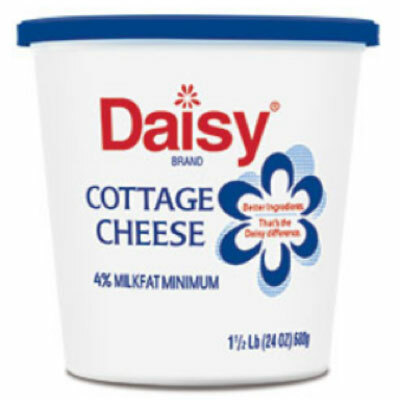 Some cottage cheese has additives to prevent it from separating (xanthan gum or guar gum). These gums do the same things as expensive milk solids. Look for fewer ingredients on the label and avoid the gums and thickeners if you can – although some of the recommended brands include the additives. Most recipes call for small curd cottage cheese. Experts suggest that cottage cheese may be the ultimate late-night snack. Consuming protein in cottage cheese 30-60 minutes before going to sleep is said to improve muscle quality and recovery, metabolism and health. Protein drinks or bars provide similar benefits, but cottage cheese is a whole, mostly unprocessed food which brings the added benefits of vitamins (Vitamin A, B1, B3 and B6) and minerals (iron, magnesium, potassium, zinc, copper and calcium). It does contain sodium, so be careful if you are on a low salt diet. You can eat cottage cheese by itself or with fruit. Dress it up with honey and cinnamon. Add it to granola as you would with yogurt. Put it in high protein pancakes. You can mix in hummus, Siracha or Worcester sauce. Try it with cucumbers and tomatoes. It stays moist in lasagna and on top of pizza. Make Chicken Alfredo in Cottage Cheese Sauce, or just use the sauce for pasta Alfredo. It can even be part of dessert. 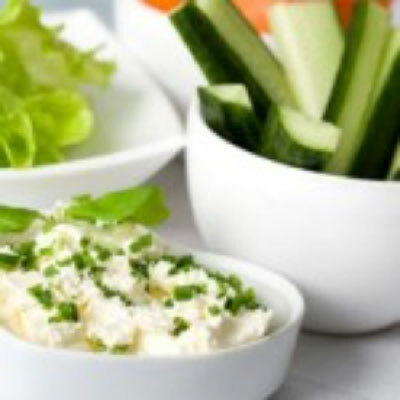 Cottage cheese makes a great dip with crudités. Here are some mash-ups of several popular dip recipes. You can change the spices and proportions to suit yourself. Use cottage cheese with whatever level of fat you like, but bear in mind that low-fat varieties can break apart and get watery, especially in cooking. Mix all ingredients together with a spoon, or blend until smooth in a food processor or blender. Cook’s Illustrated has done research into the best cottage cheeses. 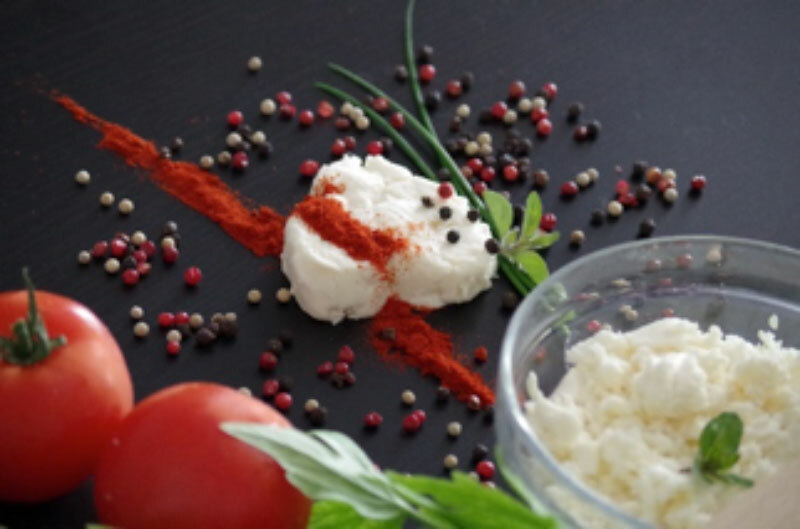 Cottage cheese can be bold and tangy or mild. You will have to experiment to suit your taste. The testers at Cooks Illustrated preferred the ones with a stronger, tangier taste. Their favorite was Daisy with 4% milk fat. The ingredients are cultured skim milk, cream and salt. 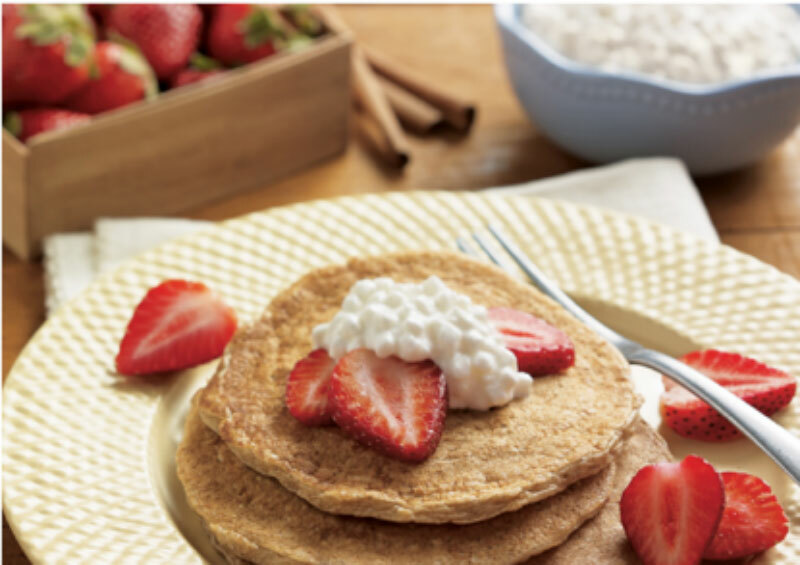 The Daisy website offers pages of cottage cheese recipes including these protein-rich pancakes. 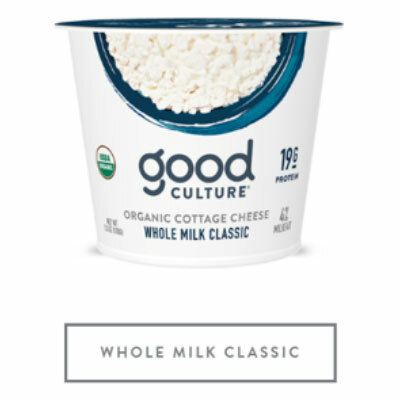 Cooks Illustrated offers other good cottage cheese choices. Good Culture Organic Cottage Cheese with 4% milk fat. Ingredients: Organic Skim Milk, Organic Whole Milk, Organic Cream, Celtic Sea Salt, Live and active cultures. 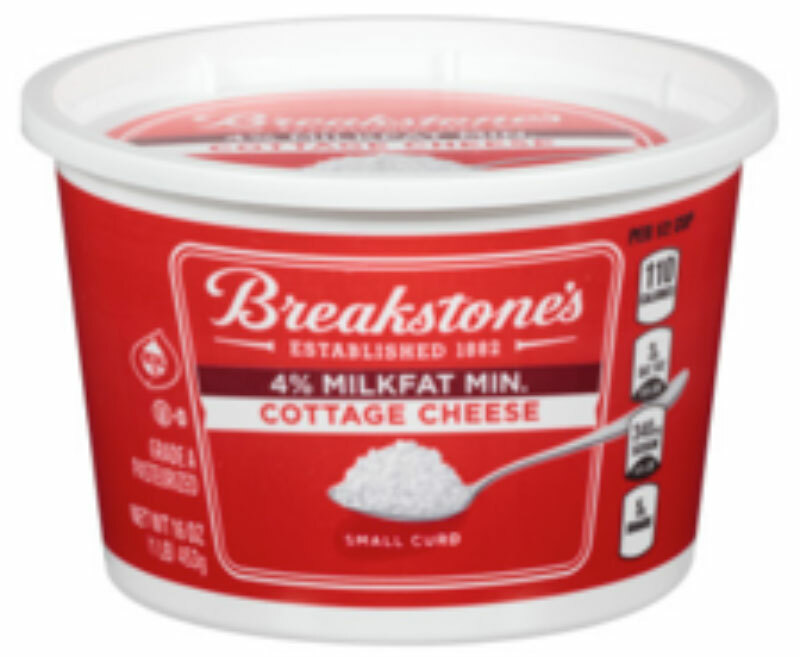 Breakstone’s 4% Milkfat Small Curd Cottage Cheese. Ingredients: Cultured pasteurized grade A skim milk and cream, whey, contains less than 2% of modified food starch, salt, calcium phosphate, xanthan gum, guar gum, natural flavor, vitamin D3. 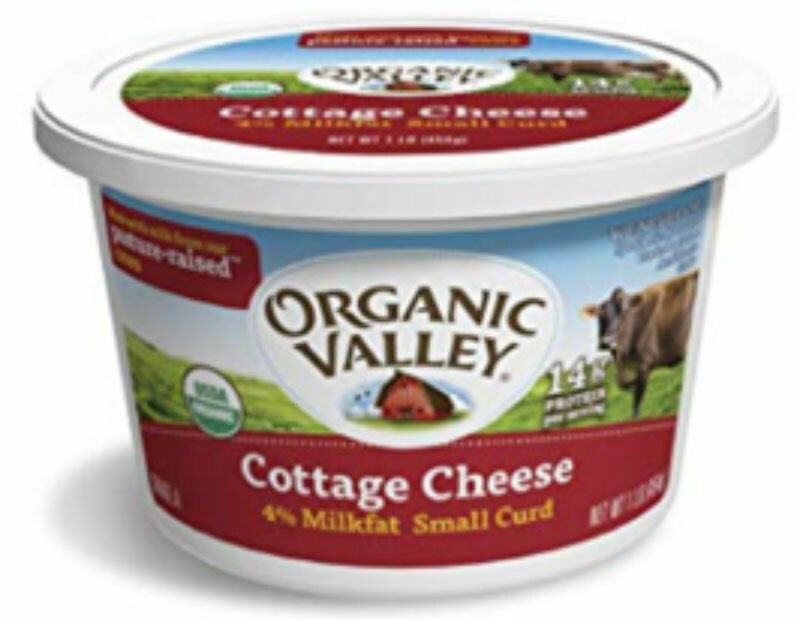 Organic Valley 4% Milkfat Small Curd Cottage Cheese. Ingredients: Organic cultured pasteurized skim milk, organic pasteurized cream, organic nonfat milk, salt, citric acid, organic guar gum, organic locust bean gum, acidophilus and bifidus cultures. If you prefer a milder cottage cheese, so did the testers at Epicurious. 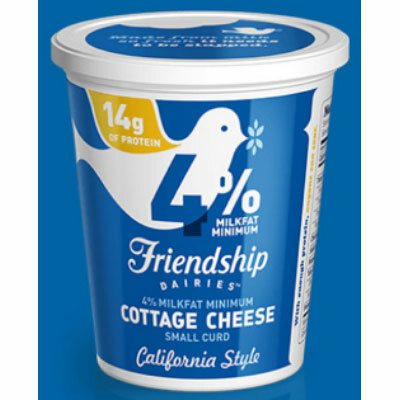 They chose Friendship Dairies 4% California-Style Small-Curd Cottage Cheese for its milder taste. Mild – not boring. They objected to the sour taste or bitter aftertaste of some other brands. Friendship does have gum in the ingredient list: Cultured Nonfat Milk, Milk, Cream, Nonfat Milk, Salt, Locust Bean Gum, Carrageenan, Carbon Dioxide* (To Preserve Freshness), Enzymes.